The Museum of Latin American Art (MOLAA) is proud to host a solo exhibition of new and recent works by Luis Tapia, a pioneering Chicano artist from Santa Fe, New Mexico. 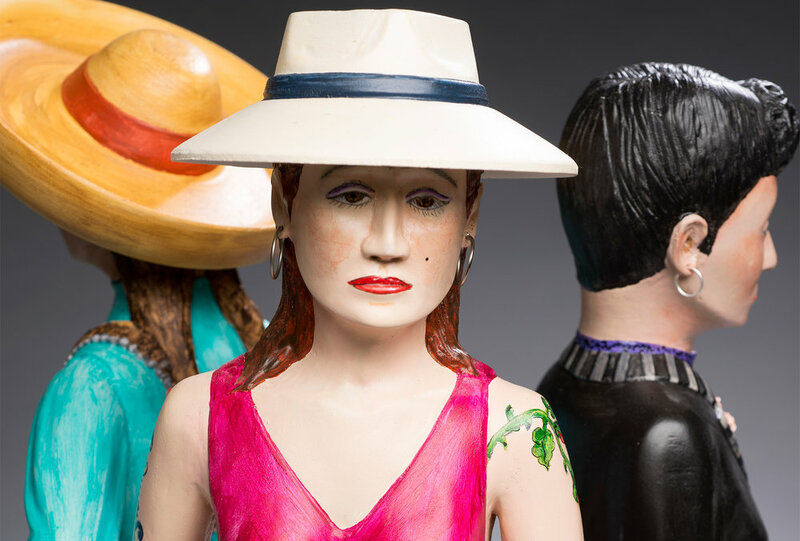 For forty-five years, Tapia has taken the art of polychrome wood sculpture to new levels of craftsmanship while utilizing it as a medium for social and political commentary. At once an artist and activist, Tapia’s innovative sculptures speak to the vibrancy and complexity of a multilayered Latino/Hispano/Chicano history and contemporary culture. While rooted in a folk art tradition established in seventeenth-century New Mexico, Tapia’s work both honors and transcends its origins, re-interpreting traditional subject matter and revitalizing age-old techniques to reflect his modern Chicano experience. Setting his subjects in innovative, brightly painted spatial and conceptual environments, Tapia eloquently expresses the urgent political or religious issues of the day, depicting the joy and humor of daily life, in soulful, profound, provocative ways. His sculptures compel viewers of all backgrounds to search their own hearts about the issues he conveys, while offering certain shared truths that present the Chicano, Nuevomexicano, and Latino experience as largely one and the same. Luis Tapia's work has previously been featured in numerous U.S. traveling exhibitions, including the groundbreaking Hispanic Art in the United States: Thirty Contemporary Painters and Sculptors (1988–89) and Arte Latino: Treasures from the Smithsonian American Art Museum (2000), as well as in recent international exhibitions in Beijing, China, and Kanazawa, Japan. Works by Tapia are in private and public collections nationwide, including the Smithsonian Institution’s American Art Museum and American History Museum; El Museo del Barrio; Museum of American Folk Art and Rockwell Museum of Western Art in New York; Denver Art Museum; Autry National Center of the American West in Los Angeles; Museum of International Folk Art in Santa Fe and the National Hispanic Cultural Center in Albuquerque, among others.